For my 16th birthday, my mom took me to New York City. For a girl who had never been on the other side of the Mississippi River, this was a Big Deal. My little sister came along, and my mom took us to the usual sights — the Met, the Statue of Liberty, the Empire State building, Times Square. She did such a good job of taking us to cool places. I’m pretty spoiled now, too, because I live close enough to NYC that both business and leisure allow for short, frequent trips to the city. This weekend my mom, sister, and I reunited in NYC together for the first time since I was 16. Each of us had been back, but never all together. It was just what we needed. In no particular order, here are the 10 Best Things from the weekend. 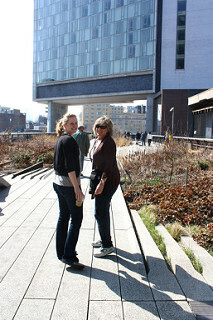 The High Line is a new-ish park build on an old, elevated rail line that runs up along 10th Avenue. It was so super fantastic that we walked half of it one day, and went back and walked the other half the next day. It’s a great way to see the city from a different vantage point, plus it’s interesting to think about urban architecture and do some people watching. This has been on my wishlist for years and I finally got to see it on Broadway! (Thanks, Mom!) It was crazy good and I’m in love with Elphaba. I want to buy the soundtrack and play Defying Gravity on repeat. 3. Shopping. My sister bought me a long, pretty gold necklace from Artists & Fleas at Chelsea Market. It was like Etsy-In-Person so I pretty much wanted one of everything. I’ll snap a photo of the necklace as soon as I’m wearing it with a cute outfit. Thanks to Airbnb.com we had a lovely apartment. We were perfectly located to be able to walk downtown (on Saturday), uptown (on Sunday), and up 60 stairs (every day — it’s on the 4th floor). We had plenty of room for the three of us, plus a kitchen, internet, TV, etc. I love staying in apartments and living like a local. We walked so much each day that each night we ended up back at the apartment early for a little couch time piled on each other. Still under construction, but allowing visitors. I’d like to see it again when it’s all finished and the trees are blooming. Before I boarded my train home on Monday I was able to meet up with one of my oldest friends. Every Monday should begin with a cappuccino, a biscuit, and a dear friend, don’t you agree? We had real NYC bagels on Sunday morning. I brought some back for my freezer for a weekend treat, too. 8. Banana cake with cream cheese frosting from Billy’s Bakery. The thing that tweets and dreams are made of. We loved the first piece so much we went back for another piece the next night. I walked into DSW wearing old, stinky, ratty shoes that I L-O-V-E, and walked out with a brand new, exact same pair, purchased for 50% off. I slipped on the new pair, tossed the old pair into a trash can on the sidewalk, and walked another few miles. 10. Just hanging with my mom and sister.